I am lucky to be (to some extent) naturally immune to the social influences of my immediate environment. For me, doing the opposite of what people expect me to do comes easier than doing what is the societal norm. So being original involved little struggle for me. I even have trouble getting a regular mentor as I think differently than every potential mentor I have come across and, worse, I change my thinking too often. My thoughts are purely mine and very malleable. There is no living person I look up to. The only person I hope to be like is Leonardo da Vinci and he's been dead for about 500 years now. My passions are also unique to me and make it hard for people to advise me. I can comfortably refer to myself as being original but I haven't been very proud of it. I try too hard to find normal sounding excuses for the not normal behaviours I have. I try to give reasonable excuses for not replying to Whatsapp messages when the truth is that I just for no reason didn't reply. I enjoy reading in the traffic, the loud background noise keeps me focused and from falling asleep. But it's almost impossible to read and drive at the same time, so I prefer taking the bus rather than driving. Then I come up with true but easily overcome-able reasons for not driving to where I'm going rather than tell the main truth. I spend most of my free time in a sleepy mode letting my mind run by itself and it's the way I come up with most of my blog posts. The trouble with it is that I don't easily snap out of that mode; any phone call that comes in goes unanswered. Then I start thinking of a more reasonable sounding excuse for not picking the call. I don't know how to give up on anyone or anything just because of the trouble they give me. I only give up on things I attempted just because someone I couldn't refuse wanted me to do it. But nature's way of keeping things in balance was to make me not spontaneous and very boring to be with in a social gathering. And this I try to explain away by finding a much less weird excuse. Original, I am; but proud of it, I am not (yet). And that is why I agree with Ralph Waldo Emerson's statement that to be yourself in a world that is constantly trying to make you someone else is the greatest accomplishment. Greatest not in terms of the value you get in return but greatest in terms of the huge effort it requires. Being yourself is in two parts. 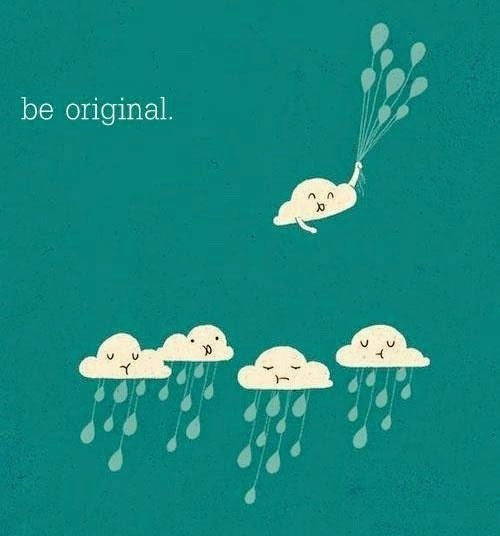 First you have to let the real you flow out (be original) and then you have to accept that real you (be proud of it). I have managed, by luck majorly, to achieve that first part but I am yet to commit to the second part. It's a lot difficult to see people have the wrong perspective of you and not attempt to correct it. And in correcting it you will want to use sound explanations that right their perspectives and not weird explanations that worsen everything. So being proud will involve choosing between two terrible options: to let people carry on with whatever idea of you they have or to worsen that idea.